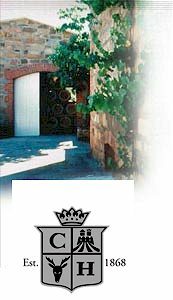 The Haan philosophy was established right at the beginning with Hanenhof Vineyards being managed as a true Wine Estate. Providing the best possible conditions in the vineyards and the winemaking has been the key to success - along with a clear understanding of wine excellence. Halls Gap Estate represented part of the second coming of the Victorian wine industry, which had seen very little new plantings since the turn of the century. The region had always had a pedigree for great wines with the first vineyards in Grampians being planted at Bests & Seppelts, in the early 1860s. The Halls Gap property had long been a respected grower for many of the country�s great wineries, Seppelts and Penfolds, until 1996, when it was bought by the famed Victorian winemaker, the late, great Trevor Mast. 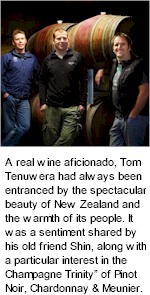 It remained a staple of Mount Langi Ghiran until acquisition by Aaron Drummond of Circe Wines in 2013. Richard's great-grandmother Grace Bussell is famous for her courage as a 16 year old when in 1876, with the assistance of aboriginal stockman Sam Isaacs, she rescued the survivors of the shipwreck Georgette at Redgate Beach not far from the mouth of the Margaret River. Richard's great-grandfather Frederick, known for his exploration of the Kimberley, read about the heroic feat in Perth's press and rode 300 km on horseback to meet her. They married in 1882. Ellis graduated as Dux of his winemaking course from Roseworthy College in 1971 and began his illustrious winemaking career at Krondorf and Yalumba wineries. In 1974 John went to the Hunter Valley to become the foundation winemaker at the newly established Rosemount Estate. Within two years John had put Rosemount Estate on the map internationally and made a name for himself as one of the young Turks of the industry. The next move came in 1978 when John, with his wife Ann Tyrrell, went to Echuca on the Murray River in Victoria, to help establish the Tisdall Winery. Tisdall quickly became a high profile and successful brand in the seventies and early eighties, enjoying something of a cult following. So said John James McWilliam when he arrived in Hanwood in 1913. The development of the Riverina region as a major wine producing area was primarily due to the foresight of the McWilliam family. The Riverina, and Hanwood in particular, was an area John James McWilliam the son of McWilliam's founder, Samuel McWilliam had identified earlier as having the potential to service the growing domestic and export wine markets. He established a winery on the banks of Adelaide's River Torrens in 1853. His Bankside winery was the start of an outstanding family wine business that grew to become one of the world's great wine companies. Thomas Hardy was a self-made man, a pioneer of immense character. With a mixture of energy, determination, shrewd judgment, innovation and a touch of daring, he pursued the highest standards in winemaking. At Bankside, and later at his McLaren Vale property Tintara, he focused on quality and craftsmanship. Tintara was to become the centre of Hardy's enterprise and by the late 1800s was one of the best-equipped and managed wineries in Australia. This success was substantially due to Hardy's initiatives in planting higher quality, lower yielding varieties rather than the coarser, heavier-yielding types more common at the time. His willingness to experiment with and to use novel equipment, much of which he designed and built himself, also contributed to this success. The Barossa is recognised throughout Australia as a vital part of the nation's heritage and is an important wine and tourist region. Explorers and settlers were attracted to the Barossa very soon after the settlement of South Australia in 1836. George Fife Angus conducted a program of assisted immigration that was to have lasting effects on the character of the Barossa. The largest group was German Lutherans who came to South Australia in 1838-1841, seeking to escape religious restrictions in Prussia. This strong German influence is reflected in the immaculate Lutheran Churches spread throughout the Barossa landscape. Along with them, British immigrants arrived to add diversity to the settlements and commence farming, grape growing and winemaking. The Hay Shed Hill property was a group settlement farm for returned soldiers from the 1st World War and was originally established as a diary farm. The current homestead, considerably renovated, still has much of the original Group Settlement look and feel. Vines were first planted in 1973 to the varieties which have put Margaret River on the wine map; Cabernet Sauvignon, Chardonnay, Semillon and Sauvignon Blanc. The property was known as Sussex Vale until 1989 when it was bought by Barry & Liz Morrison. The Morrison’s were instrumental in establishing what you see today, managing to turn a fairly run down farm with a few vines into a quality grape producer with nearly 18 ha of vines. The place was planted right, the right varieties on the right slopes with the right soils. The winemakers today enjoy the advantage of working with truly mature vines. 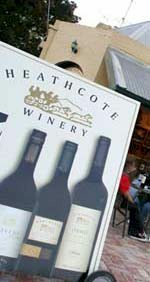 During the 1850s, Heathcote was the scene of fevered activity as an important gold field town and today Heathcote is best known for producing another rich and prized gem, Heathcote Shiraz. 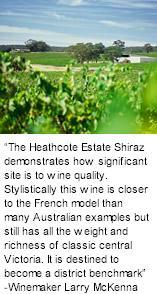 The rich red Cambrian soil and dry mild climate provide the idyllic foundation for producing world class Shiraz and are indeed the reason why Heathcote is considered one of Australia's pre-eminent regions for our most noted variety. Uniquely positioned along Heathcote's main street, Heathcote Winery holds a surprise for many of its visitors. Few could ever expect to find a fully functioning winery directly behind a Cellar Door. The estate wineworks and adjacent art gallery are sited within the restored produce store built by Thomas Craven in 1854 to cater for the huge influx of gold miners seeking their fortune. Thomas Craven sold wine and spirits, and traded in gold. An entrepreneurial type, he also ran a coach service (depicted in the logo) from stables behind the Cellar Door, delivering supplies and mail around Central Victoria, hence the significance of the estate's Mail Coach range. The concept of terroir is the best way to describe the combination of elements that creates the distinctive flavour profiles of Heggies Vineyard wines. Unpredictable and at times downright frustrating is an apt description for this unique Eden Valley Vineyard. 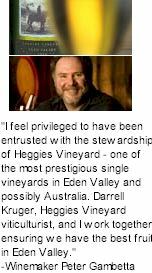 At 550 metres above sea level, Heggies is one of Australia's highest altitude vineyards and also one of its coolest. Ken and Judith Helm started the vineyard, winery and cellar door in 1973 and have built it into one of the leading wineries in the Canberra District. It continues to be a family affair with all of the family (including recent additions) playing an integral part in the business. The winemakers are Ken Helm and daughter Stephanie, who are fourth and fifth generation descendants of German vinedressers from the Rhineland, who established vineyards near Albury and Rutherglen in the 1860s. Ken's flagship wines are Riesling and Cabernets and he has connections with Riesling makers from all over the world, eg: Dr Loosen and Katharina Prüm in the Mosel and Dr Alexander Kohen from the German Wine School in Koblez. Trips to the vineyards and wineries of Mosel, the Rhine valley and Bordeaux have fine tuned the Helm wines. 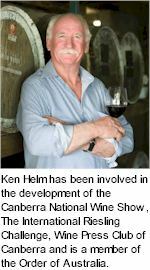 In 2000 Ken instigated the Canberra International Riesling Challenge and his continuing role as chairman allows him to constantly keep abreast of new developments in Rieslings around the world. Johann Christian Henschke purchased land for a farm at Keyneton in 1861, after fleeing religious persecution in Silesia. He planted a small vineyard and an orchard, and after initially making wine for family consumption produced his first commercial vintage in 1868, believed to be principally riesling and shiraz. Each subsequent generation built upon the reputation for quality, but it was fourth-generation Cyril Alfred Henschke who in 1958 created the wine that has most captured the red wine world's imagination - Hill of Grace. The wines of Hentley Farm are all about listening to the land and planting the right vines in the right place, in the right way. 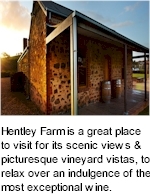 Set on the red brown earth of western Barossa, propitiously positioned on the sacred soils between Gawler and Nuriootpa, Greenock and Tanunda, Hentley Farm founders Keith and Alison Hentschke acquired the 150 acre vineyard and mixed farming property in the 1990s. Following extensive research to find out where the best red wine grapes in the Barossa Valley were being produced, their studies led them towards the rich red soils of the Seppeltsfield area. Keith used an old soil map from the 1950s to strategically locate the best parcels of land and after a number of years acquired Hentley Farm. Dean Hewitson captures the essence of history and the magic in old vines and bottles it. His passion for wine is undeniable and his desire to share this passion is even greater. 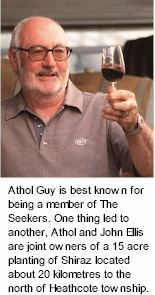 This led him to a life in which he creates wine purely for the enjoyment of others. Rather than purchasing vineyards, Hewitson made the savvy business decision to create long term associations with a network of established growers, allowing him to seek out the varietals he desired. Famed for its flagship Elstree Cuv�e Brut, its iconic Tuscan style tower overlooking the Wairau Valley, outstanding summer dining restaurant and beautiful cellar door, it�s not hard to see why Highfield is one of the most visited wineries in Marlborough. The name Highfield originates from the Walsh family, who hailed from Ireland. They purchased their 365-acre Marlborough farm in 1935 and named it Highfield after an area near Galway Bay in their homeland. On Highfield farm the Walsh family grew crops, grazed stock and bred horses, eventually handing over the reins to their son Bill and his wife Barbara. Bill was of an entrepreneurial nature, always ready to consider a new venture, and in the mid �70�s when he heard that a major New Zealand wine company was considering planting grapes in Marlborough he decided to try his hand. Since the first wine was released in 1981, Hill Smith Estate Sauvignon Blanc has earned itself a reputation as one of Australia's most awarded Sauvignon Blanc wines. Over two decades of this estate grown wine have been awarded no less than 7 trophies, 18 gold, 43 silver and 79 bronze medals. The distinctive label, featuring an original painting of the vineyard by founder Wyndham Hill Smith, combines the tradition at the heart of the Hill Smith family with the contemporary styling befitting a modern Australian classic. Hoddles Creek Estate was established in 1997 when the D'Anna family decided to establish a vineyard on the property that has been in the family since 1960. The vineyard sits astride Gembrook road and adjacent Hoddles Creek. It's steeply sloping blocks prohibit mechanical harvesting, with both vineyards being hand pruned and harvested. Hoddles Creek Estate is planted with 10ha of pinot noir (five clones), 6 ha of chardonnay, 1ha each of sauvignon blanc, merlot and cabernet sauvignon, and 1.5ha of pinot gris. Driven by quality and a hands-on approach, Hollick wines are made from three core vineyards. Neilson's Block, re-planted by Ian and Wendy Hollick in 1975, the nearby Wilgha vineyard, purchased in 1987 and the Red Ridge vineyard developed in 1998 at Wrattonbully, giving Hollick over 200 acres of vineyard in total. Eighty percent is planted to red varieties, including Cabernet Sauvignon, Merlot, Cabernet Franc, Shiraz, Pinot Noir, Sangiovese and Petit Verdot. The balance of the vineyards are planted to the white varieties of Chardonnay, Riesling, Sauvignon Blanc and Semillon. Houghton Wines, based in the heart of the Swan Valley, contains a wealth of romantic history. Named after Lieutenant Colonel Richmond Houghton in 1836, the first commercial vintage was produced in 1859 totalling 25 gallons, the foundation for one of Australia's oldest continuous winemakers. The picturesque Houghton winery property today has fifty hectares planted with premium grape varieties including Verdelho, Chardonnay, Semillon and Chenin Blanc. Early documentation and current research suggests the first vines were planted between 1830 and 1836. The founding owner of Howard Park, John Wade ventured west to Western Australia’s southwest with one belief: “I don’t know any other region where you can produce both Riesling and Cabernet Sauvignon as premium wines”. This founding belief began the journey of Howard Park. 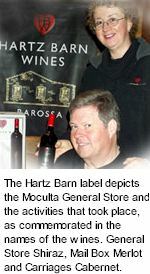 Howard Park remains a family owned winery under the guidance of Jeff and Amy Burch. With a philosophy to produce wines of distinct regional character with an uncompromising commitment to quality Howard Park has forged an international reputation for their wines and an expanded range including single vineyard and multi regional wines from Margaret River and the Great Southern. The two region philosophy aligns with Howard Park’s goal which adopts an ethos for integrating the old with the new. The Howling Wolves lair is a large, modern state of the art winery on seventeen picturesque hectares of rich, ochre soil shaded by tall stands of native trees, one of the largest in Western Australia. No detail has ever been overlooked in the winemaking process and no corners are cut in applying the most exacting standards of vinification. Initially established to process grapes and provide the very best service to local growers, Howling Wolves now collate the most exceptional parcels of Margaret River fruit to be vinified under their own label. The story of Hugo Wines is intrinsically linked to the property on which the vineyard is established. 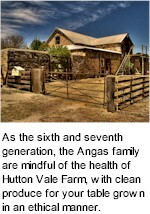 John Hugo's maternal great grandfather, George Sauerbier acquired the property and first farmed the land in the early 1900s, originally a Southdown sheep stud, grazing cattle and dairy, almonds, glasshouse tomatoes and mixed cropping, not to mention paddocks of grapevine meant for personal consumption. At that time, anything planted had to perform and provide a return, whatever the soil and climatic conditions. Huia is located in the Wairau Valley, in Marlborough, at the north eastern tip of the South Island. Claire and Mike Allan established Huia Vineyards Ltd in 1996, a small private company committed to the production of premium and classical Marlborough wines. Claire and Mike were drawn to Marlborough by the intense fruit flavours in the wines. 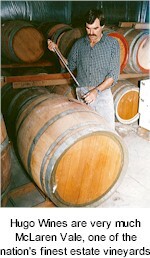 They gained further winemaking experience in key Marlborough wineries, along with an extended spell in Champagne, France. Hungerford Hill has always pushed the boundaries. Since its founding in the 1970s in the world famous Hunter Valley, Sydney's doorstep, Hungerford Hill has been at the forefront of multi-regional winemaking, producing award-winning wines from Australia's best regions. 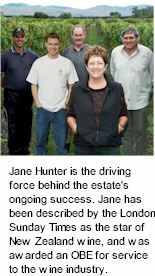 Jane Hunter is the driving force behind its ongoing success. In 1995 Hunter's Wines was one of the first wineries to achieve ISO accreditation. Not surprisingly, Jane has been described by the London Sunday Times as the star of New Zealand wine. Jane was awarded an OBE for service to the wine industry in 1993, recieved an Honorary Doctorate of Science from Massey University for her outstanding contribution to the industry in 1997 and in 2003 recieved the innaugural Wine & Spirit Competition Women in Wine Award (UK). Homeland to rolling hills and big red gums, some over 400 years old, with girths too big to wrap your arms around. The farm has produced a wide range of things since its inception, from fresh and dried fruit, to tobacco, sheep, cattle and grapes. Even ostriches were farmed here 160 years ago for their feathers & leather. Each generation has adapted to the changes of life around them, working hard over the last 170 years to promote and enhance the natural environment of our family farm. Being respectful of the authority of Mother Nature, and aiming for the farm�s produce to capture what the soils and the seasons will allow, has always been at the heart of Hutton Vale philosophy.